If you were to look at Social Media the United States and many other parts of the world, you would believe that the world of Social Media was flat, dominated by social continents including Facebook, Twitter, blogs, YouTube, and Flickr. As we zoom in, we visualize other established and emerging social services that depict provinces and outlying settlements of our social atlas. Over the years, other maps emerged that documented leading social networks around the world as well as the social behavior associated within each country. As Social Media is truly global and relationships are truly without borders, I too have spent a great deal of time researching the networks that host conversations relevant to my projects regardless of geographic location. 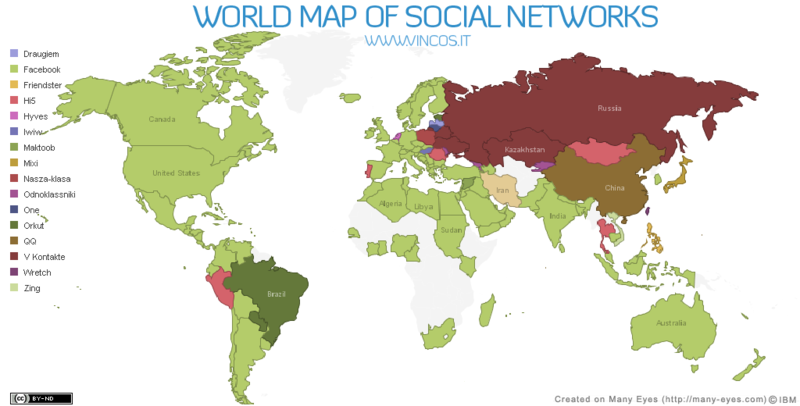 Italian blogger Vincenzo Cosenza has for the second time, published a visual map that portrays the most popular social networks around the world based on the most recent traffic data (December 2009) as measured by Alexa & Google Trends for Websites. Upon review, it’s clear that Facebook, at 400 million, is truly earning a global audience, which naturally burrows its social roots with every new connection and the connections of connections forged within the network. According to research, Facebook dominates in 100 out of 127 countries measured. If we were to analyze the top three social networks by what many argue are the top 10 markets for social networking, our view comes into focus and allows us to see where our attention and participation is required in our global efforts. In other parts of the world, social networks that might not have registered previously among leading experts, emerge as candidates when location and society prove paramount in highly targeted, culturally-aware programs. For example, Google’s Orkut is Brazil’s top social network. Hi5 is leading in Mexico, Peru, Portugal, Romania, Thailand and Mongolia. In the Czech Republic, Lide is the network of choice. Maktoob is the social hub in Libyan Arab Jamahiriya, Oman, Saudi Arabia, Yemen. South Korea is focusing its dialogue and connections in Cyworld. Social networking in Guadeloupe and Martinque is concentrated at Skyrock. Mixi is the leading central station for social activity in Japan. The race for supremacy in social networking is only part of the story. As in any race, we typically expect a winner to reach an end. However, this competition is absent of finish line and as a result, a true overall winner is beside the point. 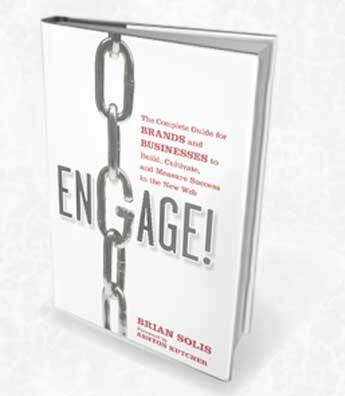 Many networks will enjoy time in the spotlight until their luster ages and a new framework for engagement lures our friends of friends, our friends, and finally our attention and participation. As consumers, we go where we are not only wanted, but also where we can make an impact. While we’ve reviewed the top social networks across the social Web, ranked by countries spanning the globe, the balance of the story is represented in the actions that define social media engagement within each network and influenced by the culture of each country of prevalence. TrendStream analyzed social media activity around the world and captured the results in a stunning infographic. This graph essentially unravels the ties that bind us and peels back the layers of social networking technologies and platforms to reveal how real people are adopting and engaging in the social web. The map demystifies how social media is embraced around the world, demonstrating that social computing and collaboration is far from ubiquitous. And, in many countries, how we use social media is much different than how we will use it over time. We’re still in the very early stages of the social (r)evolution..
TrendStream in partnership with Lightspeed Research interviewed 32,000 Web users in 16 countries. As such, the Global Web Index analyzes active social web involvement and then organizes and presents behavior by volume (in millions). Reviewing the Global Web Index and fusing the information with the data included in the World Map of Social Networks, we can get a clear indication of how social behavior defines social networks and to what extent. It’s a goldmine of data for any brand or government agency seeking a more influential form of propaganda (2.0). In 50% of the countries included in this study, online photo sharing dominated the list of social media applications. It is also among the oldest of social services within the included mix. 44% of the countries in this survey embrace online profiles in social networks suggesting that their personal brand, whether for engaging in personal or professional interactions, is becoming increasingly important. 81% shared photos and online profiles as the top 1 and 2 activities with the exception of Japan, China, and South Korea where blogging displaced social profiles as a top application. 94% of countries reported that micro-blogging (think Twitter) were among the least pervasive with the exception of Japan, where it ranked fourth – just below social network profiles and above video. TechCrunch also observed a tremendous opportunity for Facebook in Russia. Leading network Vkontakte.ru is in many regards, a Facebook clone. However, its facsimile of a growing global network is also indicative of a potential deal. Vkontakte is owned in large part by Digital Sky Technologies, a company which also owns a noteworthy stake in Facebook. A deal of this magnitude would further socialize Russian and other worldwide users under one truly global social network. As we examine opportunities for global social networking, we are reminded that anthropology and sociology play critical roles in observing and documenting behavior, supporting cultures, and established governances for dictating how content, information, and relationships forge and flourish. In order to ensure relevance and earn significance within networks, we must think locally when examining opportunities globally. In addition, as culture and behavior shifts across countries, they also establish a new dynamic within each Social Networks creating a universal population that adapts what they know to what they learn and experience.